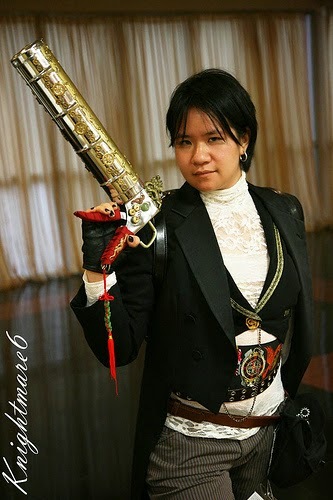 This week we're looking at one of the champions of multiculturalism in Steampunk, Ay-leen the Peacemaker (Diana M. Pho). Ay-leen discusses some of her most recent projects. In her life as an editor for Tor Books, she's starting off this week at JordanCon and ending it at the International Steampunk Symposium. She's also the author of the Beyond Victoriana blog, which is one of the foremost resources on Steampunk and retrofuturism from outside a Western-dominant, Eurocentric perspective. Thankfully she was able to take some time to answer questions for us! I am an urban adventurer with a penchant for all things retrofuturistic and timey-wimey. I was introduced to Steampunk by my fiancee, Lucretia Dearfour, who basically described it as her and her friends, dressing up in sci-fi anachronistic Victorian clothing, going to conventions, and having people take pictures of them. XD But I also know that steampunk had become much more – I would now define it as an art movement inspired by retrofuturism and 19th century science fiction and fantasy. Please describe one of your creative processes. I work as an editor by day, crafter/costumer by night, and I run a blog. So there are a lot of different processes I think about in terms of “creativity.” I like being absorbed by art – my art or other people’s – and then breaking it down into all sorts of bits and pieces and putting it back together again, only stronger. That’s basically how an editor works, that’s how a cosplayer thinks, and that’s what many steampunks do. Stories, especially folklore and mythologies. New ideas and processes. Scientific discoveries that impact society. A good shot of fine vodka. I wrote the introduction to the Best of Spanish Steampunk recently (here’s an interview I also conducted with co-editor Marian Womack), where I talk about the impact of local histories when conceptualizing steampunk stories, and Monturiol, who invented the first steam-powered submarine. Read and be curious. Don’t be afraid to fail with a project and have to start over from scratch. Don’t get caught up with some idea that to be “successful” you have to be some sort of community icon. Always be open to new ideas and to share your own. So glad for your interview with Ay-leen the Peacemaker. I've been an avid follower of her blog and really enjoy the history she covers!